The HMS Beagle was a Cherokee-class brig-sloop. The original construction drawings obtained from National Maritime Museum in Greenwich. The book ‘Anatomy of the ship HMS Beagle’ by Karl Heinz Marquardt. The book ’Seamanship in the Age of Sail’ by John Harland. The HMS Beagle was a Bark of the Royal Navy with an armament of 7. Designed by Sir Henry Peake and built by Woolwich Dockyard, England. 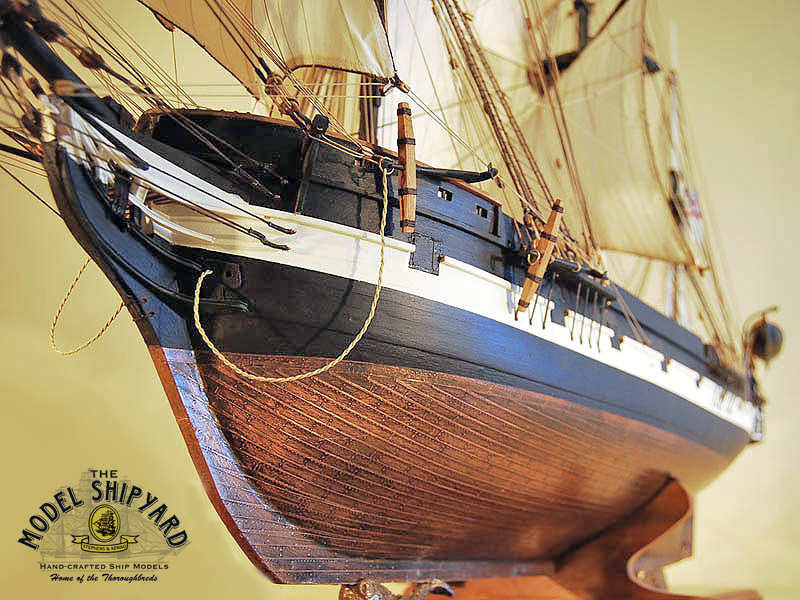 She was launched in 1820 with a complement of 75. During the Beagle’s first major voyage from 1826 to 1830 with HMS Adventure, while skirting the southern edge of Tierra del Fuego, the Beagle channel was explored and named. When the Beagle returned to Buenos Aires, Lieutenant Robert FitzRoy took command for the homeward voyage, commanding her on her circumnavigation and chronometric observations. The naturalist, Charles Darwin accompanied them on this journey. After three months of hydrographic surveys along the Brazilian coast, The Beagle continued to Argentina where Darwin first discovered fossils. In 1833 the Beagle returned to Uruguay via the Falkland Islands. She sailed through the Strait of Magellan into Chilean waters and arrived in Valparaiso in 1834. The Beagle conducted coastal surveys while Darwin made overland treks in the Chilean Andes. The Beagle arrived at the Galapagos Islands later that year and it was here that Darwin made the observation that there were 13 different species of finches. This proved the foundation for his theory of natural selection. The primary mission for the remainder of the voyage was to make chronometric observations. After stops in New Zealand, Australia, Tasmania, the Cocos Islands, Mauritius and Cape Town, St. Helena and Bahia, she finally returned to Falmouth in 1836. Darwin’s voyage on the Beagle laid the foundation for his theories of evolution and natural selection and profoundly affected the course of modern scientific thought. A lavish five-volume set by Darwin, The Zoology of the Voyage of HMS Beagle, was published from 1839 to 1843. After exploring Australia under command of Captain John Lord Stokes, the Beagle returned to England in 1843. After 18 years hard service to her nation and the world the Beagle ended her days as the Beagle Watch vessel moored at Pagelsham Pool on the coast of Essex. She was sold and broken up in 1870.